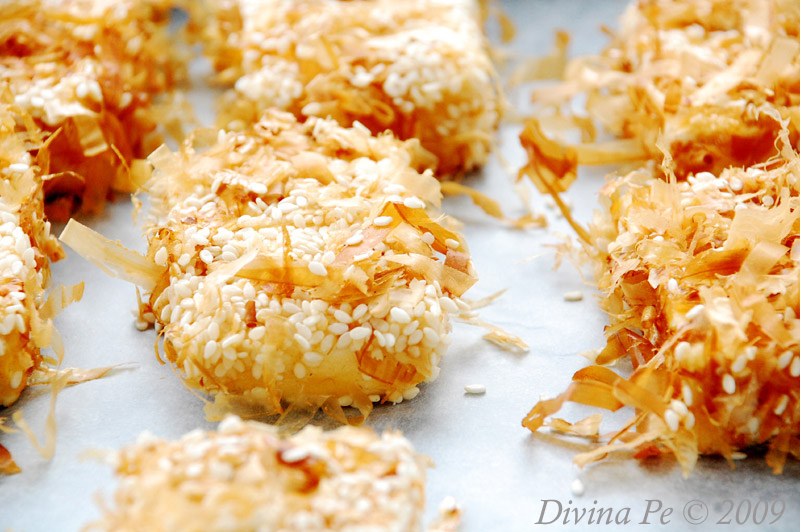 Guest posting today and sharing her delicious recipe is Divina Pe from “Sense and Serendipity”. Divina has a wonderful blog filled with fantastic recipes and beautiful pictures. This is a great and elegant appetizer that I’ve made a few months ago. I paired it with a soba noodle salad but they are also great on it’s own with a dipping sauce. I don’t consider tofu as a whole food but they have been a part of our meals in Asia and all over the world. When Erica emailed me asking me to guest post for her blog My Colombian Recipes and she needs it soon, I thought of this dish. I am using a semi-firm tofu which is between a firm and a soft tofu. They have the right consistency, not too soft and not too firm but still imparting enough smoothness and texture. I drain the tofu onto a plate lined with paper napkin to the drain the excess moisture. Tofu is also a good source of protein and great substitute for meats. When I don’t know what to cook, I chose tofu. The sesame seeds which are high in calcium provide a nutty flavor and aroma when toasted. You can do a combination of white and black sesame seeds. The bonito flakes add some saltiness and texture. I would like to serve this with some grated ginger and chopped green onions for extra zing. And tofu will not be the same without dipping it in a soy and vinegar mixture. The result is fantastic. To prepare the tofu, drain the tofu from the container and rinse gently. Place the tofu into a plate lined with double layers of paper napkin to drain the excess liquid. You can also add pressure by placing a plate on top. You can do this in advance. 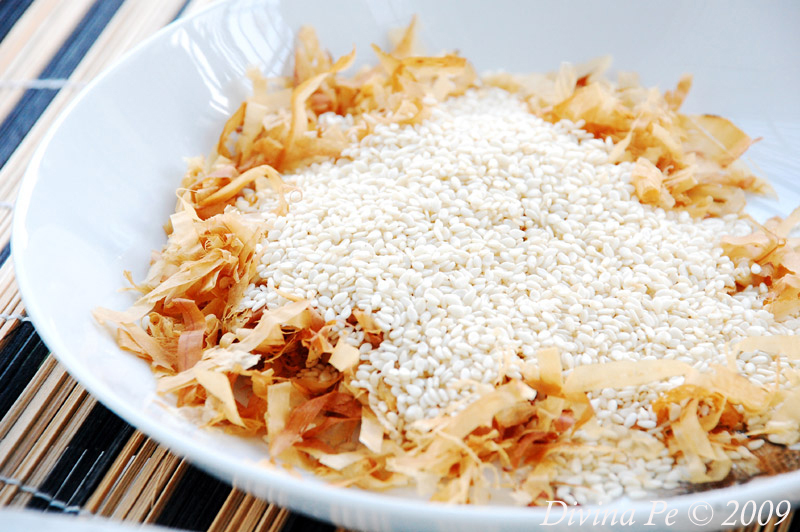 To set up for breading, first combine the bonito flakes and the sesame seeds in a shallow bowl. In another bowl, whisk the eggs until evenly blended. Then, place the flour into the third shallow bowl and set everything aside. To prepare the dipping sauce and the condiments, first combine the soy sauce and the vinegar in a small bowl. Next, trim and chop the green onions, the peel and grate the ginger. Place them into two separate small bowls. Cover with saran wrap and set aside. To “bread” the tofu, coat each piece with the flour and shake off any excess. Then dip into the beaten egg and then set into the sesame-bonito flakes mixture. You may need to grab the sesame seeds and sprinkle on top of the tofu as they settle at the bottom of the plate. Transfer into a baking tray. Prepare a plate lined with paper napkin. To cook the tofu, heat a large non-stick pan over medium-high heat and the oil. Once the oil is hot but not smoking, add the crusted tofu and lower the heat slightly. Be careful not to burn the sesame seeds and the bonito flakes. Cook the tofu for about 2 minutes on each side or until lightly golden brown. Transfer the tofu to a paper-napkin lined plate to absorb excess oil. You can also place them on a cooling rack but the paper-napkin is better. To serve the tofu, transfer them onto a plate and serve with the chopped onion, grated ginger and dipping sauce. 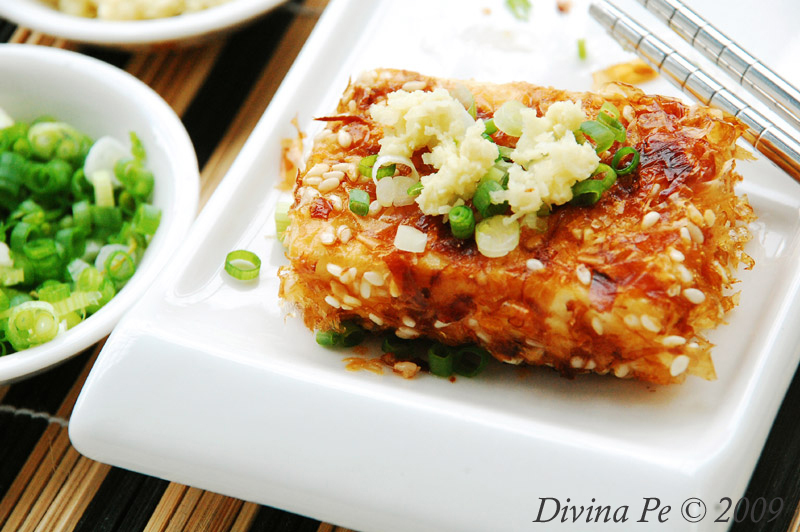 Sprinkle each tofu with chopped green onions and grated ginger before dipping lightly into the sauce. Chopsticks would come in handy. Serve them hot and enjoy. Instead of all-purpose flour, you can also use brown rice flour. 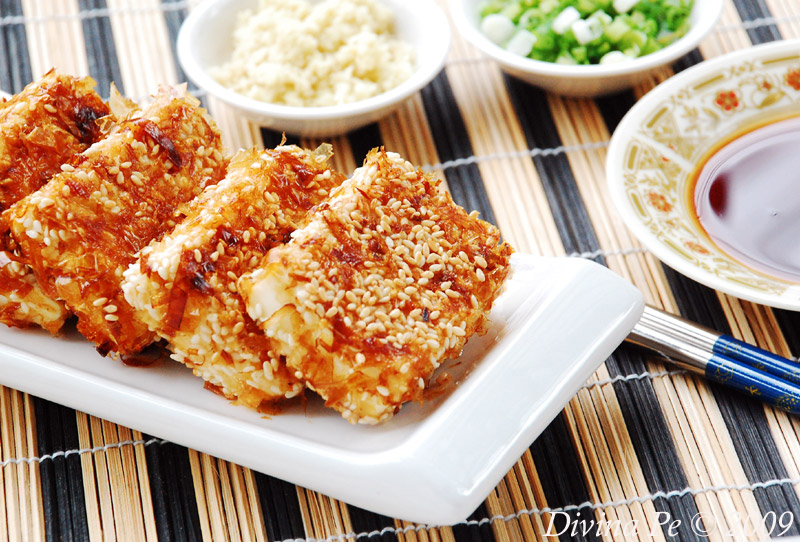 Just make sure that the tofu is very dry before coating it as they will form lumps when the tofu is still wet. « A Sandwich or Hamburger Recipe? Neither – a Delicious Uruguayan Chivito! Thank you so much for sharing this post with me and my readers! I really appreciate it! This tofu dish looks fantastic! Gotta try it! This recipe is terrific! I typically add ginger, bonito flakes and green onions with soft tofu, so this recipe is particularly appealing. Thanks for sharing! The tofu dish looks so delightful, Erica! Thanks a lot! I love Devina’s blog! Great recipe!! I love the way Divina tells about the dishes, so I try to visit her blog whenever I have time. This one looks like an awesome appetizer although I’ve never had tofu. We don’t have it in the markets here. And her pictures are fantastic as usual. Thank you guys for visiting my site and leaving a comment! Oh my, I’ve never made anything like this but it sounds absolutely amazing! Thanks for sharing. Thanks for sharing. I love taufu. Will try this! A very beautiful preparation of tofu! This looks great! I am trying it out tonight. Uh…this is not meatless. Bonito is dried fish flakes. This is not vegetarian.